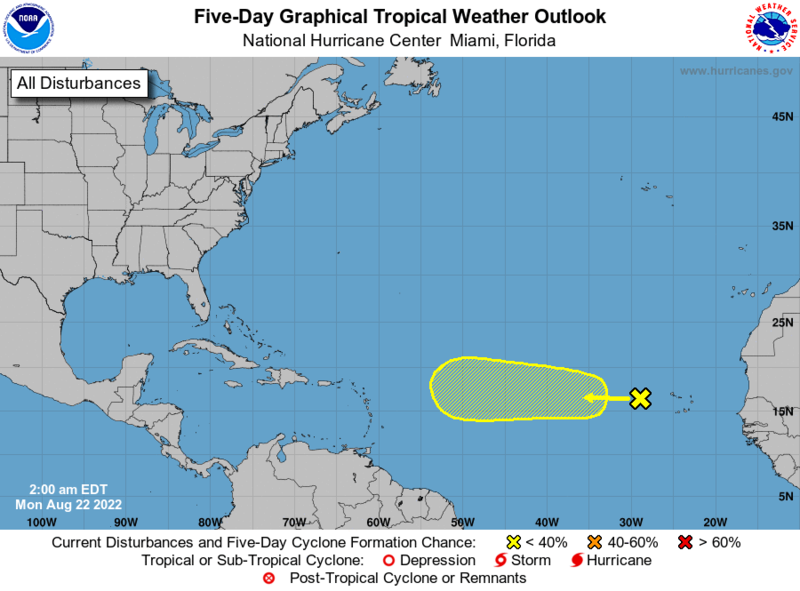 Invest 99L, a broad area of low pressure in the eastern Atlantic, will continue moving westward toward the Lesser Antilles during the next 3-4 days. This low, being large in size and lacking in thunderstorms, is not an imminent threat to become a tropical storm. However, large waves such as this one have the potential to survive for several days until they reach a more favorable environment and/or become more compact, at which point they sometimes develop. Whether 99L will be able to eventually develop into a tropical storm is uncertain. The large circulation means that 99L’s exact track is difficult to predict, and its track will have a large impact on its future. A track over the Greater Antilles or the central Caribbean could destroy the disturbance, but a track north of Hispaniola could allow some development in the longer term if 99L survives that long. The large circulation also means 99L will need a lot of time to become more compact, which is necessary for development. For now, 99L is not showing any signs of organizing further, and model forecasts have trended less aggressive with 99L’s development over the last 24 hours, usually a sign that the system will struggle, at least for a while. Large-scale descent is also present across the tropical Atlantic right now, generally suppressing convection, which makes it more difficult for 99L to form thunderstorms and consolidate its circulation. The National Hurricane Center currently gives 99L a 50% chance of developing into a tropical storm over the next 5 days, and I agree with these odds given the uncertainties currently present. At this point, 99L is not an imminent threat to the Lesser Antilles. However, even if 99L does not become a tropical storm before reaching the Caribbean, these waves always have the potential to generate tropical storm-like conditions in the Lesser Antilles if they are healthy. Potentially adverse conditions from 99L could reach the Lesser Antilles by Wednesday next week. Tropical Storm Earl has strengthened overnight as expected. The recon aircraft early this morning found a pressure of 989 mb and winds of up to 70 mph. Earl is nearing hurricane strength, but intensification remains gradual for now, as a coherent eye structure has not yet become established. If the storm’s inner core becomes robust later today, a period of more rapid intensification may occur, and Earl has the potential to be stronger than forecast at landfall. Right now the National Hurricane Center forecasts Earl to have 80 mph winds at landfall around 2am tomorrow morning. Hurricane warnings have been issued for the entire Belize coastline and the bay islands of Honduras, including Roatan.